Consumers lean heavily on their emotions when making purchasing decisions, whether they’re buying a house, an engagement ring, or a box of cereal. So it should come as no surprise that buying a book can also be an emotional choice. At Self-Publishing Relief, we know that when readers are choosing a book, they want to be uplifted, or entertained, or challenged, or edified, or scared out of their wits. Book buyers make purchasing decisions based on their emotional needs. As a self-published novelist, your cover art and your back jacket copy (especially the book summary) are your final point-of-purchase pitch to get readers to buy your book—so they must live up to the emotional promises implied by your packaging and branding. A flat, dry, unenticing book summary will cause potential buyers to move on to someone else’s book. 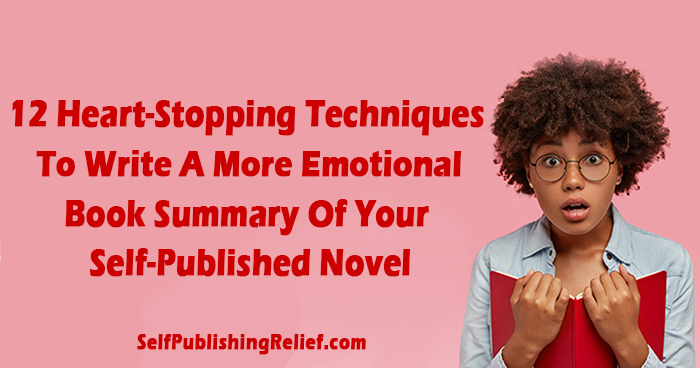 If you want to boost sales, you need to write an emotional (but not overwrought) book summary of your self-published book. Know your genre tropes. To write a great book summary for your genre, read lots and lots of examples. Professional copywriters know the strategies that turn book browsers into book buyers—and those strategies change from one genre to the next. Study, scrutinize, and make their techniques your own. Set the mood. You may want to open your novel summary with a line that quickly sets the tone of your story. Is it witty and comic? Spine-chilling and gritty? Readers will make instant judgments about your book based on the summary’s first line. Get your hook in. If your book makes use of an especially great hook, don’t bury it in the second paragraph. Decide what makes your book stand out and position it front and center. Don’t neglect characterization details. Your main characters drive the book’s summary, so include details that make them seem familiar and relatable. And shine a light on any characteristics that are uniquely memorable and fascinating. Write dozens of one-line character summaries, then pick the one that feels the most emotionally compelling. Focus on one or two characters only. In a short book summary, readers won’t be able to emotionally connect with more than one or two characters. If you spread your summary too thin by asking readers to get emotionally involved with multiple characters at once, they won’t feel emotionally attached to any characters at all. NOTE: If you’re writing an ensemble cast book, you might need to ignore this suggestion. Just be sure that each character in your summary is defined distinctly and precisely. Highlight high stakes. Vulnerability is key to making readers care about characters—so what makes your character vulnerable? What does he or she stand to lose? What if the worst happens? The more real and staggering the consequences are, the more readers will become emotionally involved. Learn more about how to maximize your main conflict. Escalate conflict. Most novels ratchet up the tension in increments—and your book’s summary can do the same. Highlight one or two elements of conflict to keep readers emotionally engaged. End on a cliffhanger. Readers who devour books report that they “had to find out what happened next” or they “couldn’t stop turning pages.” Never give away the ending in your book summary. Why should readers pay to read your book if they already know how the story ends? Instead, hint at staggering revelations to come. Make readers desperate to find out more. Choose powerful words. Some words feel more visceral and emotional than others—even when they all mean basically the same thing. Refer to your mental thesaurus (or—okay—your online one) to use words that make punch-in-the-gut impressions. Skip adverbs. Most adverbs are a sign that a better word choice is available. Embrace short sentences. Distracted readers may have difficulty focusing on long, winding sentences when they are deciding whether or not they will find emotional satisfaction from a book. Break the text into bite-sized sentences and paragraphs so readers can quickly digest the summary and choose to buy your book. Quote others. Quotes from readers, reviewers, and other authors offer social proof that your book lives up to its emotional promises. Choose only the juiciest snippets of quotes with the most energetic words—and save lengthier quotes for other marketing materials (if you use them at all). Certain genres don’t lend themselves to big, emotional, splashy summaries—and that’s okay! Readers of literary fiction aren’t necessarily looking for explosive impact; their interest lies in the subtleties of our emotional lives as human beings. Question: What makes you feel immediately emotionally invested in a story?